Seth Anderson's curious critters were born from day-dreamy doodles in the marginalia of his school notebooks. Without focusing on the pages in front of him, Seth would press pen to paper letting instinct and memory guide his hand. As he made the transition to adulthood, Seth abandoned these innocent drawings for a successful career in architecture. His scribbles lay fallow for 15 years until his sons unearthed them and happily decorated their bedroom walls with their dad's rediscovered doodles. Seth's reimagined series of his amateur explorations in drawing offer the artist, his sons, and art appreciators of all ages a dynamic connection to the past. In the middle ages, the long-legged giraffe was known as the speedy camelopard. However, unlike the camelopards of centuries past, Gerald isn't much of a runner, in fact, he's content spending his days lazing about your home, bringing his lovable, lay-about character to playrooms, nurseries, and hallways. 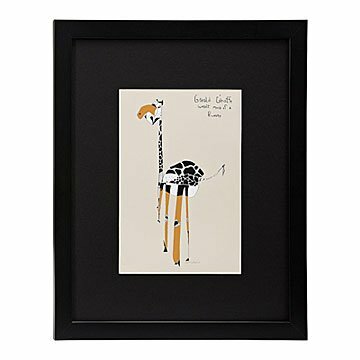 Give Gerald the spotlight or introduce this lanky loafer to Seth Anderson's other, quirky creatures to create a personalized sanctuary. All prints are fine art giclee prints printed and framed in Oregon. The original drawing was drawn with pen and pencil on paper. Made in the USA. Seth Anderson's BLACK EYED GUY is a lifestyle brand that encourages you to be self-expressive, to be fearless, and to live life as an adventure. His hope is for adults to remember and kids to embrace the simple pleasures of just being a kid. Black Eyed Guy’s Creator and owner Seth Anderson followed this philosophy from an early age. The delightful doodles that make up Black Eyed Guy, Inc. began in the margins of Anderson’s notebooks when he was in high school. Today, Black Eyed Guy is based loosely on his family experiences reflecting the idea to get in there and get dirty, don’t be afraid to get that black eye, and always be creative! Anderson lives and works in Santa Fe, New Mexico and has been a professional artist and designer for over 15 years. He has shown his contemporary paintings in galleries throughout the country, created many designs for home products marketed from small boutiques to large retailers, and has developed into an accomplished architectural designer with projects being published in Architectural Digest and Mountain Living. framed in oregon, also available unframed matted with black mat. Seth Anderson's curious critters were born from day-dreamy doodles in the marginalia of his school notebooks.